Dean of Freshman Thomas A. Dingman '67 invited freshman to a meeting Wednesday to address the Friday arrest of a black undergraduate. UPDATED: April 21, 2018 at 7:10 p.m.
Several freshmen and proctors said they feel uncertain for the future at a meeting with administrators Wednesday night meant to address Cambridge Police Department officers’ Friday arrest of a black College student that some have called an instance of police brutality. Dean of Freshmen Thomas A. Dingman ’67 emailed freshmen Tuesday to alert them to the meeting, which took place in the common room of Straus, one of Harvard’s freshman dormitories. In addition to Dingman, Ivy Yard Dean Michael C. Ranen and Elm Yard Dean Jasmine M. Waddell also attended the discussion. At the event, students said they feel frustrated in the wake of the arrest. Attendees particularly questioned why CPD made the arrest—Harvard University Health Services was first contacted on Friday, but HUHS transferred the call to the Harvard University Police Department. HUPD then transferred the call to CPD, according to protocol. Before his arrest Friday, the student was standing on a median in the middle of Massachusetts Avenue. 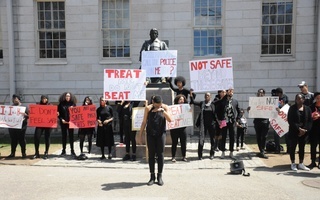 Though feet from Harvard Law School, the student was off-campus and was thus outside HUPD’s jurisdiction, which strictly comprises campus ground. The student was arrested Friday after he and four members of local law enforcement—including three CPD officers and one Transit Police Department officer—engaged in a physical confrontation. The officers tackled the undergraduate, who was naked and likely under the influence of narcotics, to the ground. A video of the incident later published by the New York Times shows the student standing still surrounded by four officers while the officers talk to him for at least several seconds. The student takes two steps towards one officer before taking a step back and raising his arms to chest-level. Then another officer tackles the student from behind. While the student remained on the ground, at least one CPD officer punched the undergraduate in the stomach five times in an attempt to handcuff him, according to the CPD police report. The student was ultimately charged on several counts including assault, resisting arrest, and indecent exposure. BLSA has called the incident an instance of police brutality. The arrest has roiled campus and drawn national headlines. 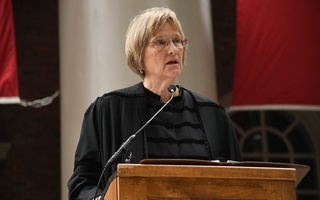 On Wednesday evening, some students said they feel frustrated with Harvard’s administration. 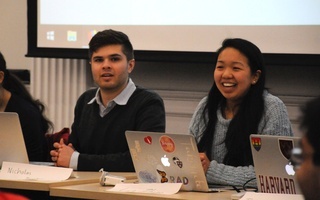 The students asked for clarification of the amnesty policy—a policy that prevents intoxicated or otherwise impaired students from incurring disciplinary charges from Harvard if a friend delivers that student to HUHS or HUPD. Attendees also asked for further clarity on jurisdiction boundaries between CPD and HUPD. Ruva Chigwedere ’21 said she attended the meeting to reemphasize students’ concerns to administrators. “I really wanted to impose the fact that we want action and to lay out specific things that they could do to make the situation better and specific frustrations, and I knew that I wasn't the first voice they were hearing but I just wanted to be there to reinforce it again,” Chigwedere said. Proctors—residential advisors for freshmen—echoed and supported students in their frustration at the discussion. Khurana wrote in his email that the College can only share a “limited” amount of information in order to protect the student’s privacy. Proctors said they feel uncertain regarding what to tell freshmen going forward. Abishek Raman, a proctor in Holworthy East, said he feels especially anxious about the approach of Primal Scream, a semesterly tradition in which students run around the Yard naked and often intoxicated the night before the first day of final exams. 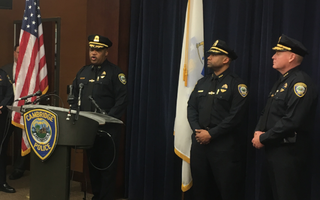 Raman noted past Primal Scream participants have run on Massachusetts Avenue, the site of the physical confrontation between the student and the police Friday. Tibbits-Nutt said that—in the wake of the arrest—she is unsure what to tell next year’s crop of freshmen about HUPD. 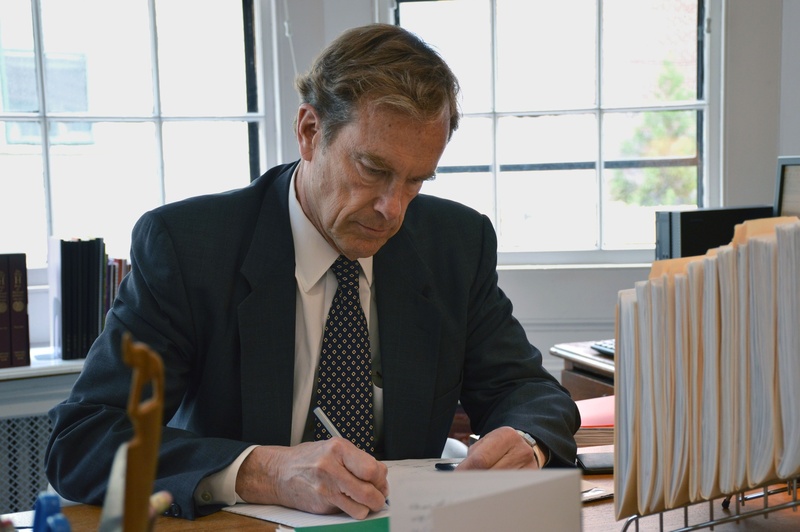 “I can't go into the fall with my new entryway freshmen coming in, and say, ‘Yes, call HUPD,’ because the thing is for me, especially as a person of color, my thing is—you call me, especially when dealing with the Cambridge police,” Tibbits-Nutt said. A previous version of this article incorrectly spelled the name of Ruva Chigwedere '21. ​Last Friday’s arrest of a black Harvard undergraduate does not mark the first time local authorities physically confronted and arrested a naked College student under the influence of drugs.